Italy is one of the few destinations in the world that almost every traveller has on their bucket list. It’s futile to attempt to explain why you should visit Italy because its history, architecture, food and art speak for themselves. The only thing to do then is to try to convince you to finally take that trip to Italy that you have no doubt been planning for years. This photoblog will hopefully inspire you to start planning your trip to il bel paese (the beautiful country). The pictures in this post were all taken in early August this year, which is traditionally high season in Italy. Once you have been to Italy and walked in the streets where Michelangelo and Da Vinci found their inspiration, you will understand what the great Italian composer Giuseppe Verdi meant when he said: “You may have the universe, if I may have Italy”. The Grand Canal: Believe it or not, this is rush hour traffic on Venice’s Grand Canal. The Gondoliers have a set route on which they ply their trade. It costs around €80 – €100 for a 20 minute gondola ride, depending on the area you want to cruise through. The busiest and most expensive area to hire a gondola is near the famous Rialto Bridge. St Mark’s Square: The striking St Mark’s Square is Venice’s second most popular attraction, after the canals of course. 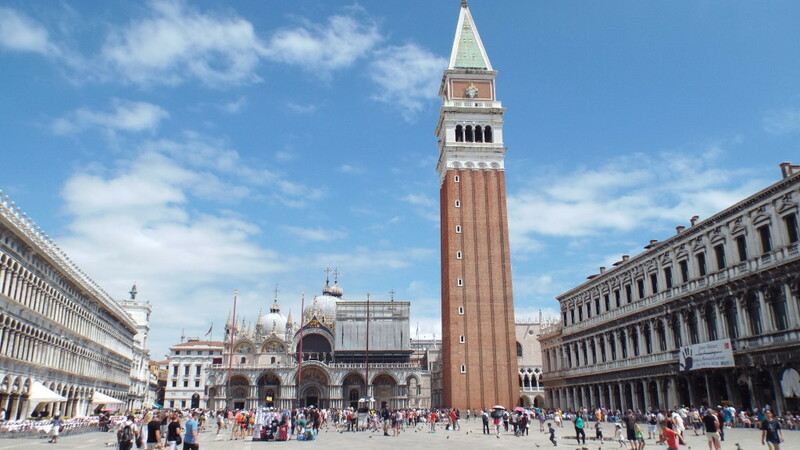 St Mark’s Basilica and the bell tower dominate the skyline around the square. The basilica can be entered free of charge, but it takes approximately 45min to an hour to get to the front of the queue. The view over Venice from the top of the 98.6m high bell tower named St Mark’s Campanile is breath-taking. Try to head up to the top around sunset when the queue is shorter. To see the sun set over beautiful Venice from the top of the bell tower will only cost you €8. 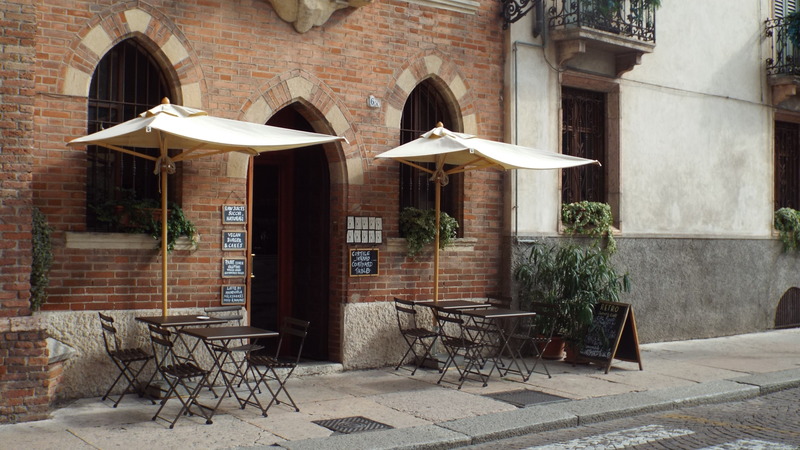 If you are a history buff then you will enjoy having a coffee at Cafe Florian on St Mark’s Square. Cafe Florian opened its doors in 1720, making it the oldest coffee house in Europe. Casanova, Goethe, Lord Byron, Ernest Hemingway and Charles Dickens were all regulars at Cafe Florian. 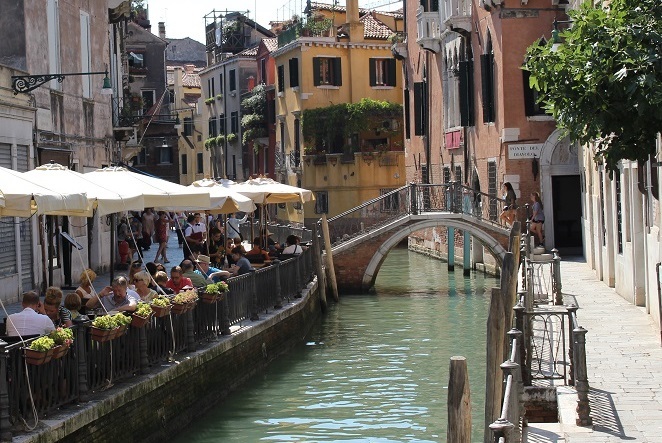 The Venetian Canals: It is difficult to describe the beauty that lies around every corner in Venice. Getting lost in the maze of Venice’s canals and alleyways is part and parcel of the whole Venetian experience. 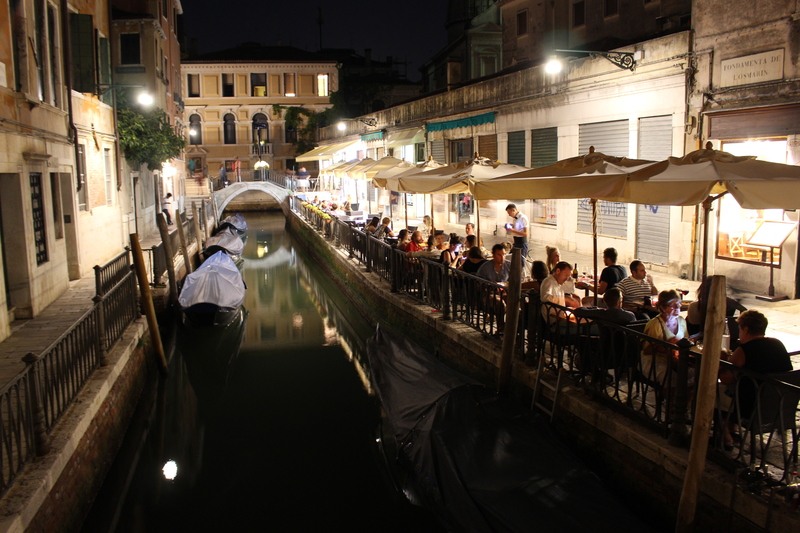 If it is within your budget, have dinner on one of the canals in the backstreets of the city. 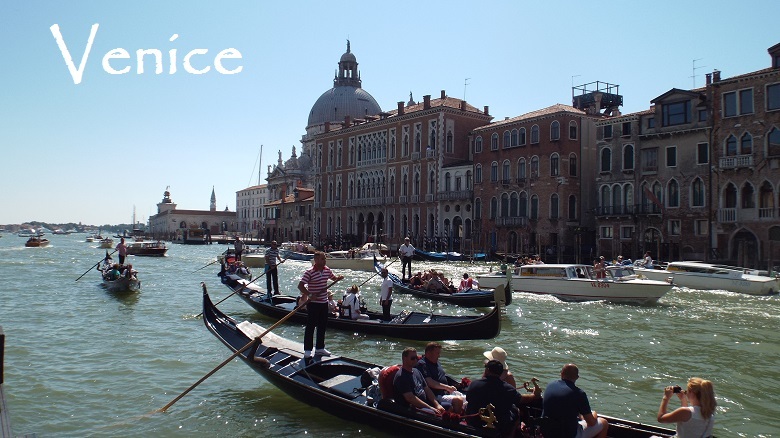 It is an experience that is truly unique to Venice. Romeo and Juliet: Verona is perhaps best known as the city where Shakespeare’s fictional story of Romeo and Juliet was set. Juliet’s balcony can be seen in a small courtyard just off Piazza Erbe. 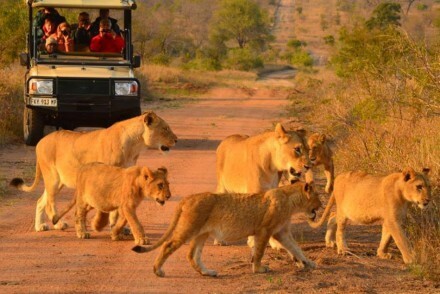 But be aware that it is a tourist trap. Verona’s roman arena, cathedral and medieval castle are all more interesting sights. 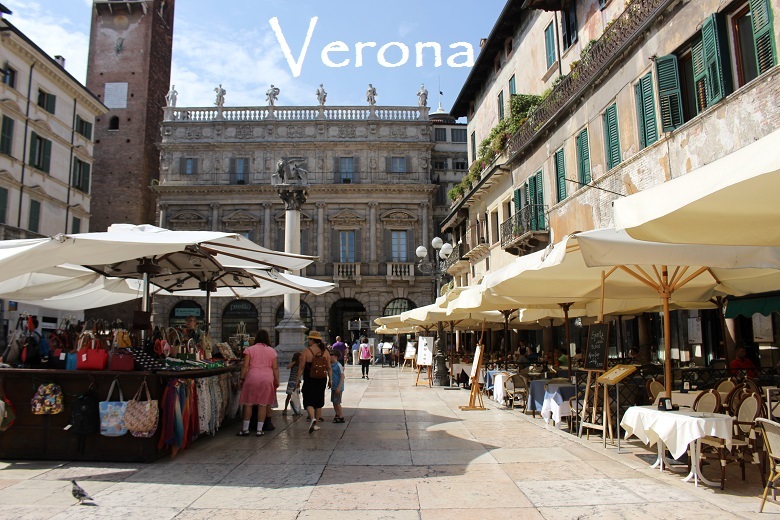 The beauty of Verona is that it is small enough to cover by foot in just a couple of hours. Once you have explored to your hearts content you can sit down at one of the many local cafes, like the one below, and savour a glass of wine and enjoy a pasta dish like the locals do. 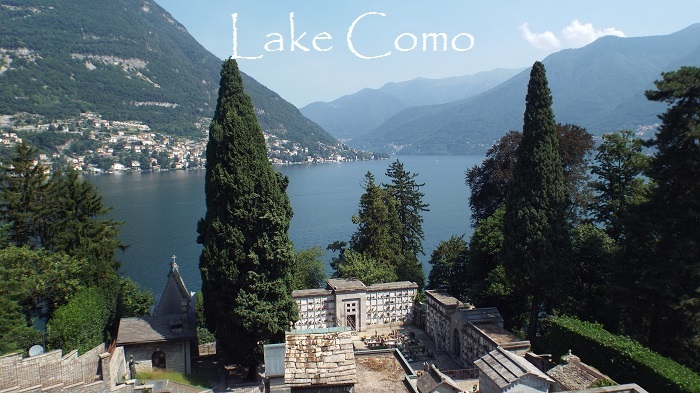 Como: The largest and oldest town on Lake Como is Como, after which the lake was named. In the 1st century BC Julius Caesar ordered the town centre to be moved from the nearby hills to its current location. Because of its beauty and the remoteness of many of the smaller towns on the lake, many famous names from Donatella Versace to George Clooney have bought houses here. The infamous fascist leader of Italy, Benito Mussolini, tried to flee to Switzerland through Como after the fall of fascism in 1945. He was captured and shot in the small commune of Mezzegra on Lake Como in 1945. Torno: The (very) small village of Torno is situated along the shores of Lake Como, only 20 minutes by water bus from Como. 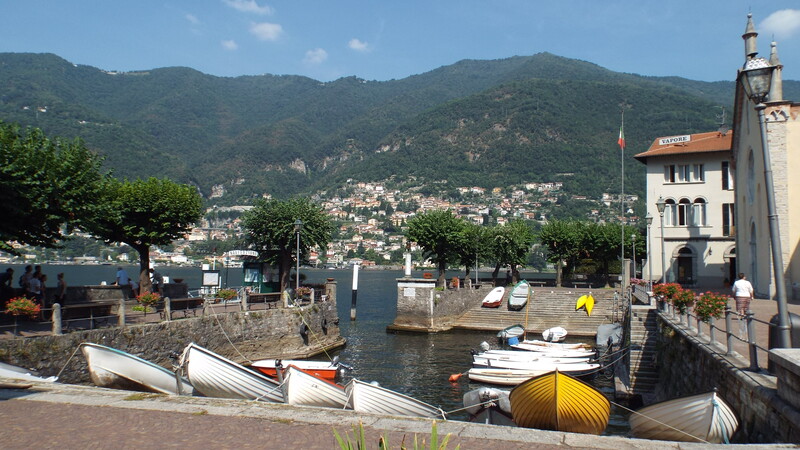 The picturesque little town is a great day trip destination for those based in Como. There is a small restaurant in the harbour that serves fresh authentic Italian lunches and cold beers at very reasonable prices. The restaurant has been there since 1892, so you know they are the real deal. Vernazza: The town of Vernazza is a 5 minute train ride or a 2 hour hike along the Cinque Terre trail from Monterosso al Mare. The Cinque Terre, a UNESCO World Heritage Site, is a string of five towns located along the west coast of Italy on the Italian Riviera. Monterrosso al Mare, Corniglia, Manarola, Vernazza and Riomaggiore are the five towns that make up the Cinque Terre. 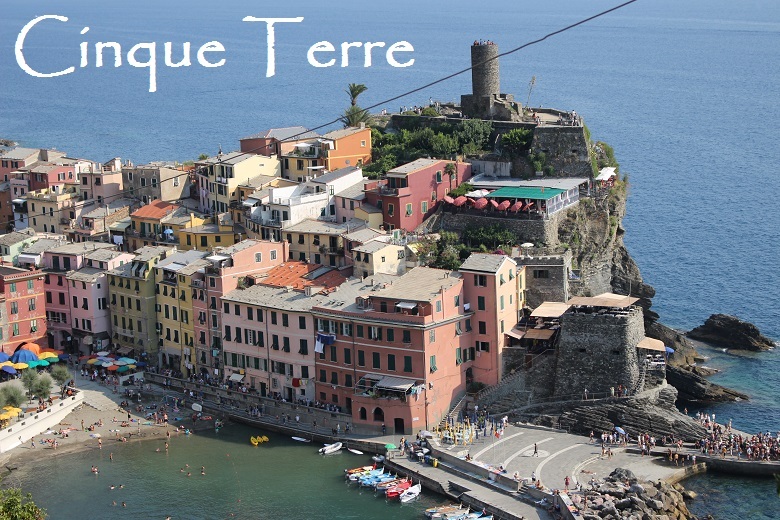 The Cinque Terre is best explored by foot from Monterroso all the way down to Riomaggiore or vice versa. The Cinque Terre trail is a hiking trail that snakes along the hills of the Italian Riviera between the five towns of the Cinque Terre. It takes a maximum of two hours to hike from one town to another. It is free to visit the towns if you arrive by car or train, but if you are going to walk the Cinque Terre trail you will have to pay €5 – €8 for a day pass. The trail is not technically difficult but it does get steep and there are some loose rocks. It is essential to take enough water along and wear the correct hiking or exercise shoes. Monterosso al Mare: The largest town on the Cinque Terre is Monterosso al Mare. The rocky outcrop to the left of the picture above serves as the boundary between the old and the new sections of the town. If you are travelling to the Cinque Terre with a Eurostar train, you will have to get off at Monterosso, because it is the only station on the Cinque Terre where these trains stop. The other four smaller towns only receive regional trains. 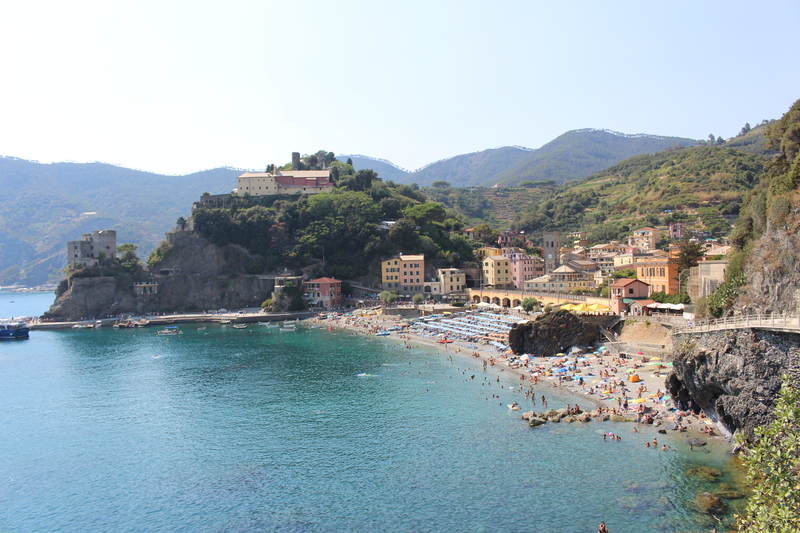 Monterosso has the only public sandy beach along the whole of the Cinque Terre. To rent two beach chairs and an umbrella for the day on one of the private beaches costs €15. The Leaning Tower of Pisa: The leaning tower of Pisa has become the backdrop of the most cliché travel photo in history. Everyone has seen a picture of someone pretending to push the tower upright. The commercialisation of the tower has taken away some of its wonder, but once you see it for the first time all that wonder comes flooding back. This 55.86m high bell tower was completed in 1350, 200 years after initial construction started. The tower leans because it was built on a clay foundation which struggles to hold the weight of the 14 500 ton tower. Mussolini tried to “fix” the tower by using concrete counterweights, but it didn’t work. It costs €15 to enter the tower to climb the 294 steps to the top. Restoration work is currently being done on the adjacent Pisa Cathedral. 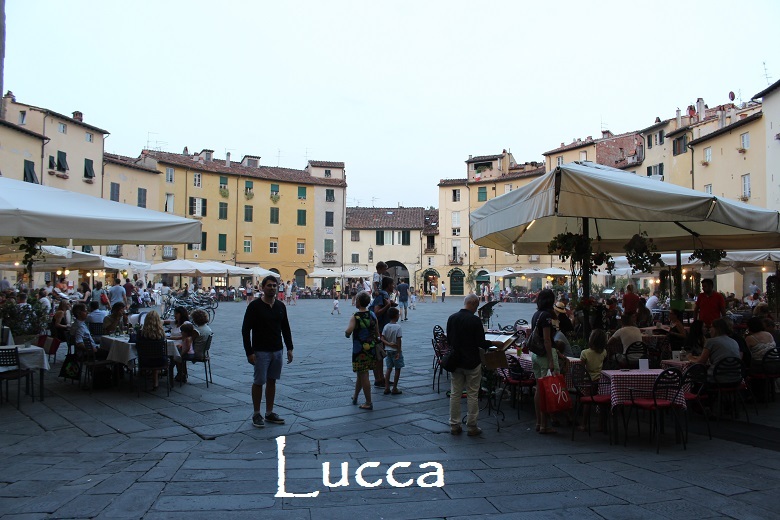 The Walled City: The ancient city of Lucca is surrounded by a 10 metre thick Renaissance wall. The wall was completed in 1650 and has not seen combat since. The Piazza Anfiteatro Lucca, as seen in the image above, is where the ancient Roman arena once stood. Today it is home to gelato shops and popular restaurants. The city once had over 100 bell towers, today only a handful remain. There is a hanging garden at the top of the Guinigi tower that is open to the public. Lucca is the biking capital of Italy. Most hotels have bicycles that they offer to guests free of charge. A night ride on the wall around the city is a must. 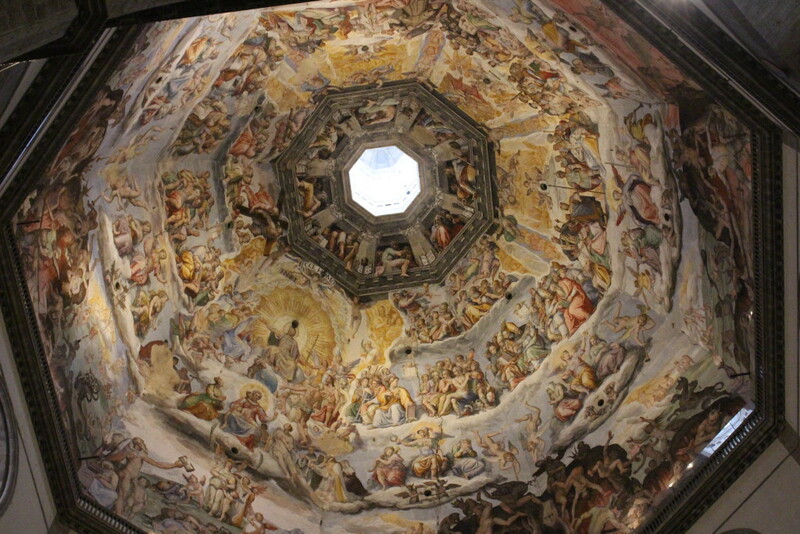 Home of the Renaissance: The roots of critical thinking, rationalism, humanism and the appreciation of art and culture can all be traced back to 14th century Florence. This is because Florence is the birthplace of the Renaissance, the bridge between the medieval period and modern history. 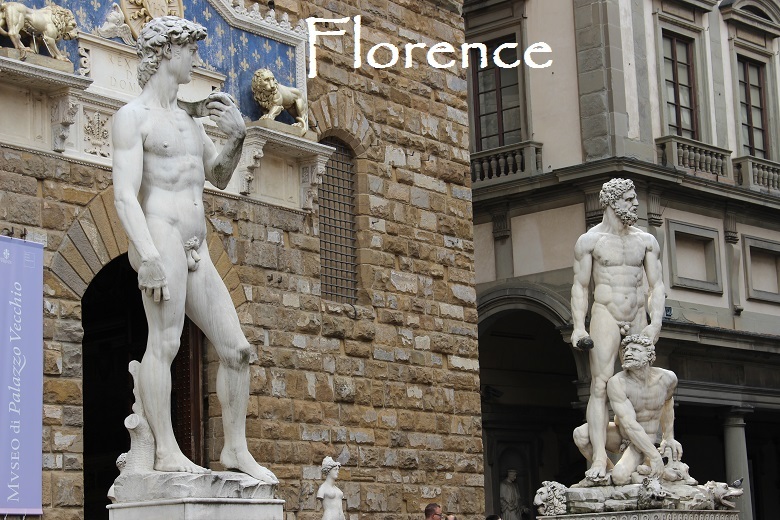 Florence is one of the most important cultural and historical cities in the world. Michelangelo’s Statue of David, perhaps the most famous sculpture in history, is housed in the Accademia Gallery in Florence. Paintings by Rembrandt, Raphael, Botticelli, Bellini and Michelangelo are on display at the Uffizi Gallery. 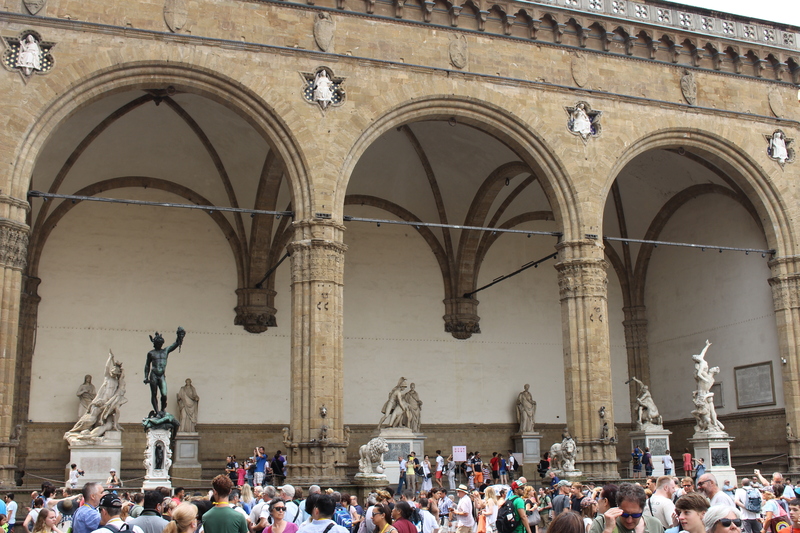 It costs €23 to enter the Uffizi gallery and €23 to enter the Accademia gallery. 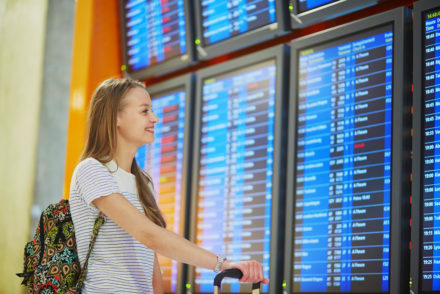 Book your tickets online before leaving for your trip because the queues can get extremely long. Basilica of Santa Croce: The Basilica of Santa Croce is Florence’s second largest cathedral, after the cathedral of Santa Maria del Fiore or Florence cathedral. The cathedral is famous for being the final resting place of some of the most important figures of the Renaissance period. Michelangelo, Machiavelli, Galileo, Foscolo, Gentile and Rossini are all buried here. That is why the basilica is popularly known as the Temple of Italian Glories. In the Medici chapel, which is at the back of the basilica, there is a bust of Galileo in a small room to the left of the altar. This is where Galileo’s sarcophagus was first placed, before it was moved to its current location because it was decided that he deserved a grander tomb. 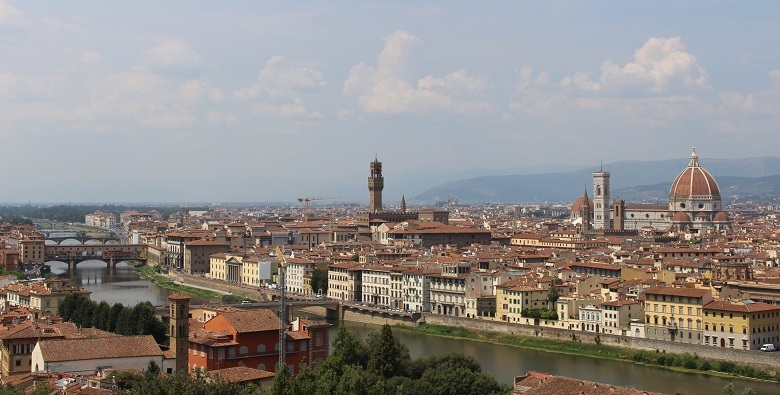 Piazza Michelangelo: The whole of Florence lies in front of you as you look out from Piazza Michelangelo. To the left, in the image above, is Ponte Vecchio, the only bridge that was not destroyed by the retreating German army during World War 2. Legend has it that Hitler personally ordered the bridge not to be destroyed because it is too beautiful. The tower in the middle is Palazzo Vecchio, Florence’s town hall and the seat of the Florentine government during the Renaissance period. The big dome on the right is the Florence cathedral. It costs €16 to enter Palazzo Vecchio, the cathedral can be entered free of charge. 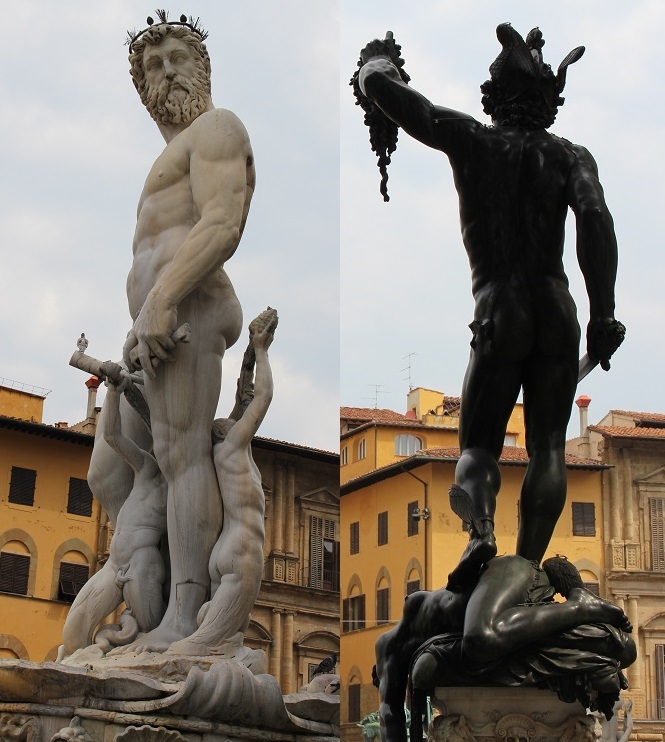 The statue on the left of the image below is that of Neptune and the statue on the right is of Perseus slaying Medusa, both can be seen in the Piazza Vecchio. 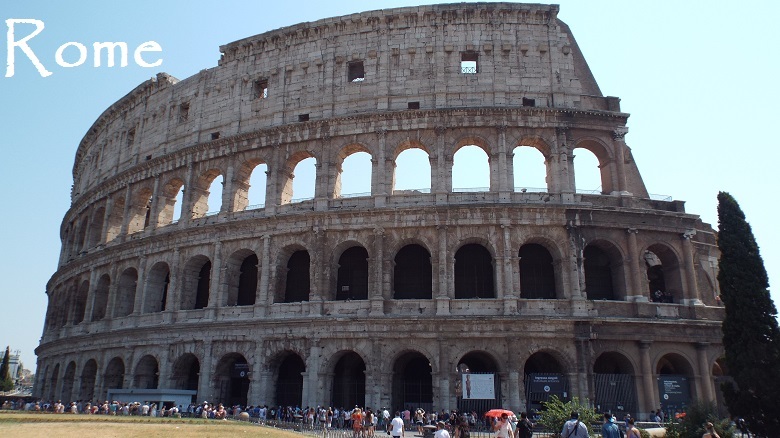 The Colosseum: The Colosseum is Rome’s most popular attractions. Millions of people come to see where ancient gladiators fought for wealth and glory in the Colosseum every year. Construction started in 72 AD and was completed only eight years later in 80AD. With an estimated capacity of 50 000 spectators, the Colosseum is the largest amphitheatre ever built. Historians believe that over 400 000 people and 1 million animals died in the Colosseum. Ancient Romans were allowed to enter the Colosseum free of charge. Today you will have to pay €12 to enter the amphitheatre. 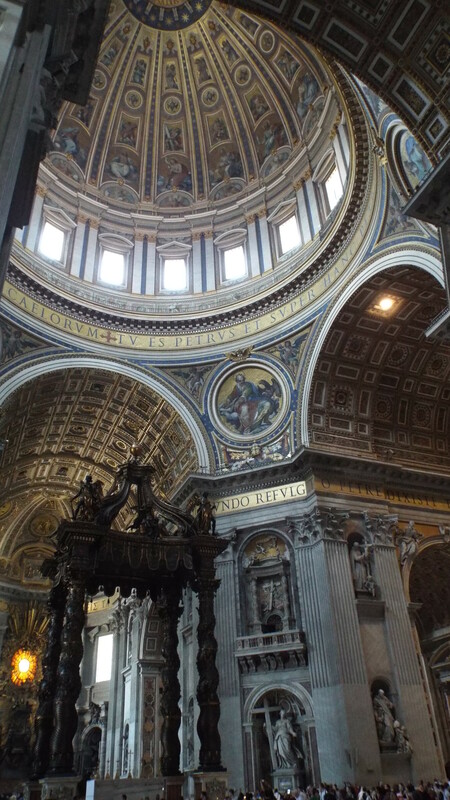 St. Peter’s Basilica: The largest church in the world and the holiest site for all Catholics is St. Peter’s Basilica. This fascinating place has over a hundred tombs including those of 91 popes. The tombs of Swedish Queen Christina and the Holy Roman Emperor Otto can also be seen in the basilica. The image above is of St. Peter’s Baldachin. Underneath St. Peter’s Baldachin is the tomb of one of the twelve disciples, St. Peter, the founder and first pope of the Catholic Church. Michelangelo’s sculpture Pietà is located at the front of the basilica. In 1972 the sculpture was attacked by a geologist screaming: “I am Jesus Christ”. He completely took off the left arm of Mary and damaged her face. Restorations were done and the sculpture was placed behind bulletproof glass for protection. The basilica can be entered free of charge. Visitors must cover their knees and shoulders before entering. Failure to do so will result in you being denied access to the basilica. 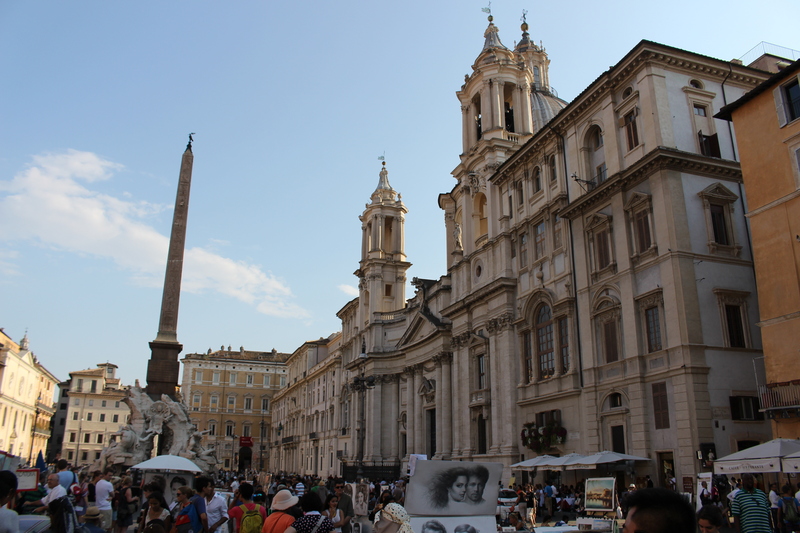 Piazza Navona: Built on the site of the Stadium of Domitian, Piazza Navona has been a public space and market since the 15th century. Today it is where artists sell their work and caricaturists ply their trade. In the middle of the piazza is the Fountain of Four Rivers. There are sculptures of four river gods located around the fountain. Each represents one of the four major rivers of the four continents over which the Catholic Church had authority. The Nile represents Africa, the Ganges represents Asia, the Danube represents Europe and the Río de la Plata represents the Americas. The restaurants on the piazza are very good but quite expensive. Main courses cost between €15 and €30. The Pantheon: Michelangelo believed that the Pantheon was the work of angels, not men. It is believed that the Pantheon was initially built as a temple for people to come and worship all the roman gods. The building was converted into a roman catholic church in 609 after it was given to Pope Boniface IV. The building is one of the best preserved ancient buildings in the world. Almost 2000 years after it was built the Pantheon’s dome remains the largest unreinforced concrete dome in the world. The Pantheon is open free of charge to all visitors. Raphael’s tomb is to the left of the altar under the Madonna and Child sculpture. Eat it all: One cannot write about Italy without mentioning the food. 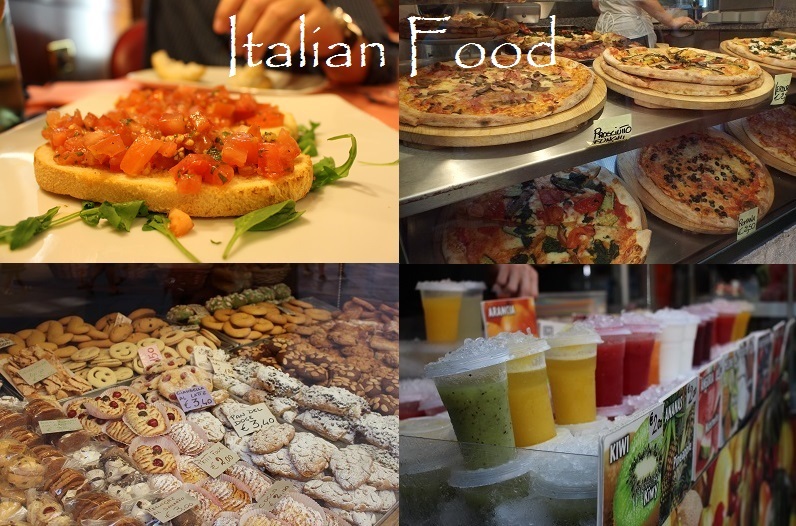 Italy is home to the calzone, pizza, cannelloni, lasagne, focaccia, ravioli, carbonara, gelato, bolognese, parmesan and even balsamic vinegar. Eat as much as you can, as many times a day as you can, because it’s all delicious. 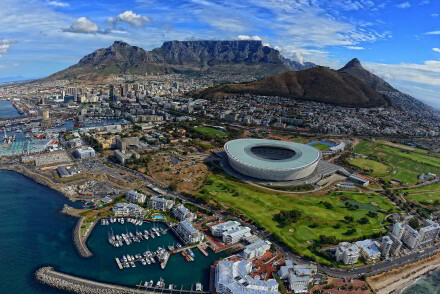 You’ll miss it when you’re back home!